Here at Victory Church we are focusing on children around the world, therefore, we have joined with Samaritan's Purse and their international project called Operation Christmas Child. OCC brings joy and hope to children around the world through gift-filled shoe boxes and the good news of God's love for them. This unique project provides everyone an opportunity to be involved in a simple, hands-on missions outreach while focusing on the true meaning of Christmas -- Jesus Christ, God's greatest gift. 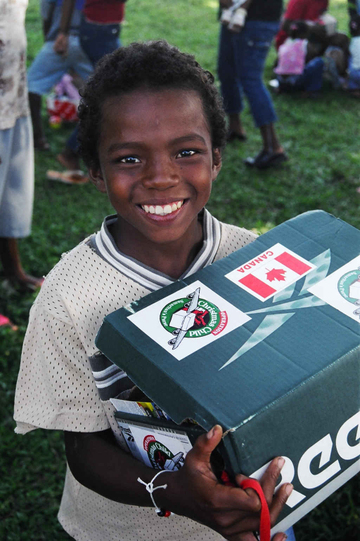 Along with the gift-filled shoe boxes, millions of children will receive Gospel booklets in their own language. Last year 7.6 million children in 95 different countries received shoe box gifts and the gospel of Jesus Christ...now that's evangelism! For those that have chosen to participate in Operation Christmas Child we are asking that you bring your shoe boxes (filled with goodies) to Victory Church on Sunday, November 12th. During our 10:30 worship service we will have a time of prayer for each child that will receive one of these boxes. If you would like more information please feel free to contact me via e-mail or call the church office at 618.566.8518, someone in the office will be glad to assist you.